So Clash is 10. February and 500 is 17. I read that my Keselowski is number 1 pick for Great American Race. What do you think who're favourites? Hard to pick a favorite in a pure lottery of likely crashes. Thanks for starting the NASCAR thread. Being a fan of Team Penske since its beginning as Penske Racing, I'll be pulling for their drivers. Ford was very strong last year and Penske is the dominant team on restrictor plate tracks (barring races that turn into a complete circus like last year's 500), but it will be interesting to see if there's any adaptation period to the new Mustang as seemed to be the case with the other makes when they debuted new cars. Any of the plate races are a crap shoot. 1st and 2nd at Daytona last year never had a top 10 the rest of the year!! I will say that the Fords will be just as strong for the championship as they were last year. Chevrolet's problems weren't all down to the Camaro body IMO, I think they are behind in the horsepower race. Watch for Blaney and Truex to be right up there. We have Richmond and Watkins Glen tickets ordered, and maybe Talladega and Texas. That would only leave Kansas and Kentucky for me to complete all the NASCAR tracks. Given how far Busch, Truex and Harvick tended to be ahead overall last year I'd be surprised if they weren't at the front again. NASCAR tends to be nice and unpredictable but last year there was often a total inevitability about those three rising to the front, wasn't there? With Larson, Elliott, Keselowski, Logano and co taking turns to offer the challenge. But then come the play-offs and you can never tell can you. I reckon Daytona will probably see some of the youngsters - the likes of Blaney, Wallace, Bowman etc, running strong but it's never much of a pointer for the rest of the season, is it? Thanks for starting the thread Branislav. I’m pulling for Aric after last years debacle. Today in 17:00 CET Nascar LIVE testing from Las Vegas Motor Speedway! As the year unfolds a major story may be potential significant changes for 2020 and beyond, including the schedule/calendar and series sponsorship model. A number of articles late last year suggested major shakeups were in the works, but whether this proves to be the case remains to be seen. Edited by John B, 31 January 2019 - 17:22. I'm also looking forward to changes in the schedule, as long as Bruton Smith's tail doesn't wag NASCAR'S dog. Color me a H U G E skeptic. I still believe this is just another nail in the coffin of relevance. This has nothing to do with the recent discussion here, but one thing NASCAR generally has more of than other series is in the commentary booth. Watching some old late 90s clips, in a "I remember when I wasn't 27 and life was easier" rabbit hole, and I was struck by the enthusiastic commentary. You know who I'm talking about. That's what I want from a commentator. Enthusiasm, and excitement. Make Busch vs. Keselowski sound like the Bismarck vs. the Hood. I love NASCAR. Never used to be into it at all. I love how big and vivid it is. I love the commentary, the unpredictability, the personalities, how American it is. I love how much the fans get into it (even if that's apparently less now than it has been). I love the paint schemes, the controversy, the fact the famous team entries (the Childress #3, the Hendrick #24, the Petty #43) are more of the star than the actual drivers. I like how actually, once you factor out the restrictor plate races, it's far more of a legitimate Motorsport than people give I think credit for. In short I'm a convert, I'll watch NASCAR races eating hot dogs with loads of mustard, listening to The Avett Brothers while reading up on whether Bigfoot really exists. I'm at least 2% from North Carolina when the Datytona 500 comes around. When in doubt, be obnoxious and American. And cry for real when Dale Earnhardt died at Daytona. And the Bismark was very good at only turning left. While being watched by a few thousand people. It feels weird to see NASCAR doing something that promotes actual, proper racing rules. Good. But weird. Well that’s long overdue. Hats off to NASCAR for actually having a sensible rule. It appears to be a clear enough rule that will actually be enforced. Over in ten minutes? You might be on to something . . . If it's alright with y'all, I'd love to make the opening OP of the year for the 500. It'll be up on Monday at some mystery hour. Cheers. I would like to discuss each race here because there are not many of as. But how do you want. The Daytona 500 still gets a decent crowd on here, depending on how easy it is to find the broadcast. The D500 deserves a separate thread. We can discuss the rest of 'em here and only do separate ones for bigger races like Dega, Charlotte, Watkins Glen and the Chase stages at the end. Edited by OvDrone, 07 February 2019 - 15:05. Are you interested in Nascar Live Fantasy game? 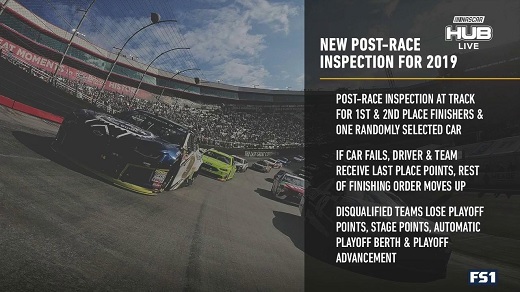 More changes down the road: the Gen 7 car now scheduled for 2021, with this year's rules package as sort of an early feeler. Edited by John B, 08 February 2019 - 19:29. I like the Mustang. It looks good on track, thought it looked slightly strange initially, proportions, angles, whatever it was. I love to see all the new paint schemes for Daytona, particularly like Ryan Newman's #6. Smart. Again, no idea who's actually going to win. Probably not Michael McDowell. There's a gallery of paint schemes for this sunday's Clash race at NASCAR.com. Jayski's page on ESPN also has many of this year's schemes up I believe. After many years of being a popular NASCAR news and info source, it was just discontinued by ESPN at the end of January, but they're still posting on Twitter (pic of a nice Truex design on Feb 1). Edited by John B, 08 February 2019 - 20:35. First wreck of the year in the books, who's on thread duty for Speedweeks? OV will do a thread... Drops on Mon/Tues. Pole qualifying going on. Byron to the top so far. And nao.. the Butch Crash. I am so damn race starved that I am watching the bloody clash. Looks like the weather from the 24 somehow lingered. Ownry 6 raps and nao Lained Out. Now I'm in the mood for some noodles. I guess since all are here and we're have a red flag...may I ask for some assistance with my NASCAR draft tonight? We get 5 picks and I'm normally 2 Penske, a Gibbs, a Hendrick and a Ganassi. I'm unsure about having 2 Ford's and wonder if I should shoot for 1 Penske, 2 Gibbs and 2 Chevys splitting the two main teams. Where do you think the Mustang body is going to be? I've bolded my top 2 choices for each round. What do you think? Fifth round is pick from whoever is left. Order is determined by dice rolls. So with that....Kyle or Logano? Edited by Nathan, 10 February 2019 - 21:05. I'd go with Ford. They look tops. Those would be my picks.